Home » Blog » Up, Up and Away over Cairns! As a child, who didn’t dream of floating away on a hot air balloon? Flying above it all, you could look down on the world spread out below you. Well, now you can do just that. With Cairns Hot Air Balloon, witness the stunning beauty of the Atherton Tablelands in Australia from a bird’s eye view. Float above the clouds and watch as the green rainforest, lush wetlands and expansive savannahs stretch below you. Gaze upon the fiery sunrise as it pierces through the clouds, and feel like you are a part of it. Your adventure begins before dawn. Arriving in time to watch the balloons fill, your sense of excitement will build as you feel the blasts of heat and listen to the belching gas fill the expanses of nylon. Soon, you are rising higher and higher into the air, and Australia stretches beneath you. You will pass the next thirty minutes viewing the world below. You may even catch sight of a few kangaroos! No worries, our gondolas are equipped with binoculars to help make sure you never miss a thing. The sights below aren’t the only thing to see! There is nothing quite like the sight of other balloons rising through the air and flitting behind the clouds next to you. 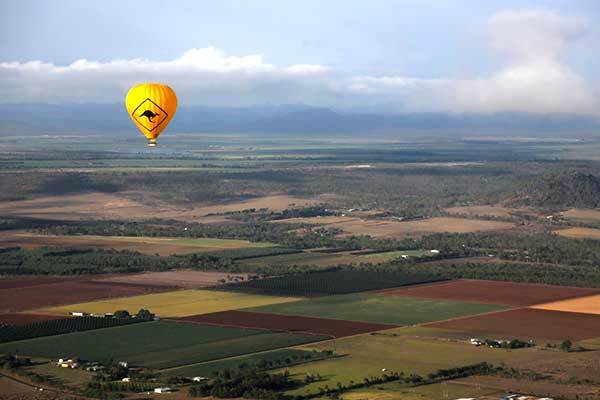 Guests will experience a cross-country hot air balloon chase as our fleet of balloons flits across the Tablelands. 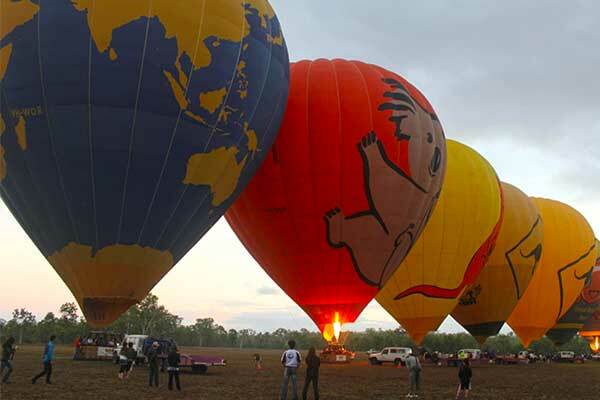 Cairns Hot Air Balloons has the largest collection of hot air balloons in Australia. Our balloons are spacious and can accommodate groups in comfort. Guests will experience their adventure in sturdy balloon gondolas with sidewalls high enough to keep you feeling secure while still granting you infinite views of the scenery below. All of our balloons receive the highest safety ratings, are piloted by experienced balloonists, and are supported by an expert ground crew. Cairns Hot Air Balloons has impressed travellers for some time now. It was “the most amazing experience!” praises one guest. “Definitely worth the money and a must to see Atherton Tablelands…Such a sensational morning,” she continues. “The whole experience brought out the child in me,” gushes another guest. To create your personal experience soaring above the clouds at Atherton Tablelands, join one of Cairns Hot Air Balloons tours. Guests will enjoy free door to door transfers from most Cairns area lodgings, and experienced guides are happy to help you get the most out of your flying adventure!